Give Julius the damn ball! Julius Jones is not a complainer, but I imagine that if he was, he’d be bitching up a storm right now about his inability to tote the rock. 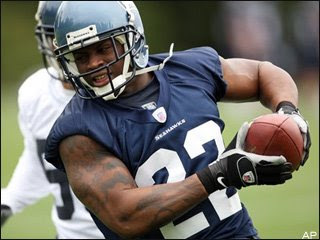 Prior to signing a four-year, $11.8 million contract with the Hawks in the offseason, Jones was forced to watch ex-teammate Marion Barber steal carries from him in Dallas, despite the fact that Jones was considered the number one tailback. Searching for greener pastures, Jones came to Seattle with the expectation of being THE GUY, not just one part of a package deal. With the big contract and only career backup Maurice Morris to really challenge him for the role of starter (T.J. Duckett is locked into that short-yardage role, but can’t honestly be considered a legit starting option), all Jones had to do was be consistent at the start of the year to lock down his role. And consistent he was. Despite the fact that MoMo started the season opener, Coach Mike Holmgren tapped Jones in relief and he didn’t disappoint, providing 45 yards on 13 carries, as well as 17 receiving yards on two catches. In Weeks 2 and 3, Jones went certifiably off, rushing for 127 and 140 yards, respectively, with a TD in each game. Yet since Week 3, Jones hasn’t come close to equaling that production, nor has he been given the opportunity. Jones received 26 and 22 carries, respectively, in the two games he went off. Since then, he has received no more than 17 carries, which came in Week 5 against the New York Giants. Versus the Giants stingy run defense, Jones managed just 61 yards on those 17 attempts. He did so under tough conditions, however. The Hawks were on one of their infamous East Coast road trips, and the G-Men were able to stack against the run with a particularly weak Matt Hasselbeck (who was eventually removed from the game due to injury) under center. That unfair shake was really the last we saw of Julius until last week at Miami when he put together an 88-yard day with just 16 carries (a 5.5 YPC average). Perhaps the most puzzling game for Jones came in Week 8 at San Francisco. The Niners were the victims of Jones’ 127-yard day in Week 2, but in Week 8 only allowed him to go for a measly nine yards. Coach Holmgren, however, may have been Jones’ biggest roadblock, allowing him to run the ball only six times that day. While the run game was stifled nearly all day long (a team total of 39 rushing yards), backup Maurice Morris was still given 11 chances at penetrating the Niners D, nearly twice as many as Jones. Morris, for all his efforts, only managed seven more yards (16) than Jones. So I guess my question is, what the hell has Julius Jones done to piss off the coaching staff? He’s put together a few nice games when presented the opportunity, but he’s only been afforded that luxury a couple times this season. And it’s not like he’s some underpaid rookie; he’s supposed to be the guy to carry the ball for this team each and every game. Come on, coaches. Let’s get Julius the damn ball. He deserves it.